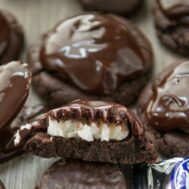 Soft double chocolate cookies are topped with a peppermint patty after baking and then frosted with chocolate ganache. They're the ultimate chocolate mint decadence! Note: this dough requires chilling! In the bowl of an electric mixer fitted with the paddle attachment, cream butter and both sugars. Mix in vanilla and egg until smooth. Mix in cocoa powder and pudding mix (just the powdery mix, not actual pudding). Beat in salt, flour, and baking soda until well blended, adding 1 tablespoon of water if needed to get the dough to form together. Preheat oven to 350°F. Line cookie sheets with parchment or a silpat. Bake for 10-13 minutes, until the edges lose their sheen. I like these a little under-done, so I take them out when the center is still a tiny bit shiny, about 10 minutes. Immediately press a peppermint patty on the top of each cookie. Let cool completely. The peppermint patties may dull as they harden, so make a ganache frosting. Place the heavy whipping cream in a microwave safe measuring cup or small bowl. Add the chocolate chips and microwave on high power for about 45 seconds (my microwave is 1100W). Whisk until smooth, microwaving for an additional 15-20 seconds as needed. Spread about a tablespoon of ganache on each cookie. If you want the ganache to semi-harden, chill the cookies. Otherwise it’ll get slightly dry but still be tacky. Store in an airtight container for up to 4 days.